NOTE: This blog post is part 12 of my INSTAGRAM SERIES - content all about helping YOU manage your way around instagram. In the INSTAGRAM SERIES I've touched on subjects such as what do the recent instagram stories changes really mean if you're a blogger, how to grow your instagram following and the one thing no one talks about in food blogging. Just click here to find all the other parts in the series. 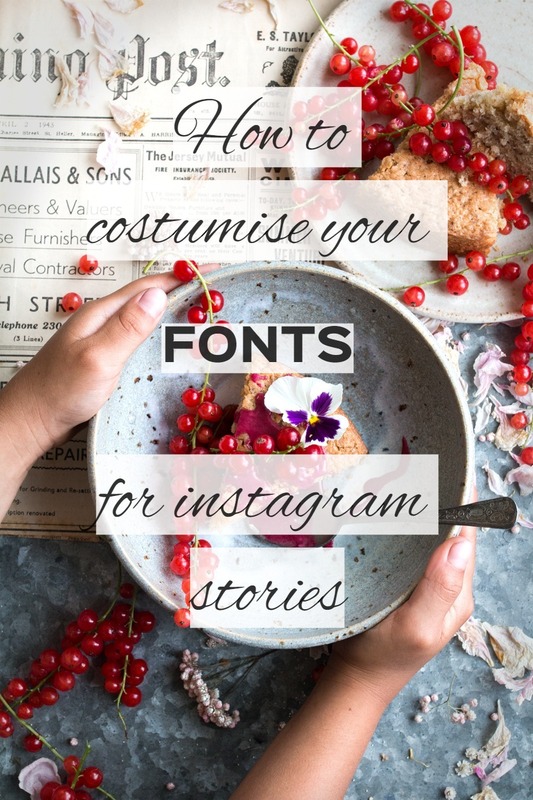 Today, I'm talking about something you've been asking me about loads on instagram namely how you can customise your fonts on instagram stories? So rather than keep you wondering, I thought I'd put this blog post together with the BEST tools to help you costumise your instagram stories. I've also prepared a handy PDF cheatsheet with a condensed version of this information, which you download if you sign up to the newsletter at the bottom of this blog post. If you're serious about photography and blogging chances are you own this program already and/or are on the verge of buying it. NOTHING can beat having photoshop in your repertoire as it makes your images look amazing. Plus the fact that you can add pretty fonts is a lovely ''extra''. There are ENDLESS fonts to choose from and ENDLESS ways for you to arrange them on your images to make them look special and uniquely yours. I kept mine simple as you can see above, but there's nothing stopping you going totally wild! Photoshop and photoshop elements aren't free. You have to pay a small(ish) monthly fee to use photoshop and a one-off fee of around £80 or so to own photoshop elements. Both programs run on your computer meaning you have to go through the extra step of moving your image onto your phone before you can share it on your instagram stories. You have to resize the image to fit exactly onto your phone BEFORE adding the fonts. This is because your camera will take wider images than what's visible on instagram stories, so if you don't resize and/or if you place your fonts too closely to the edges of your image, you run the risk of having parts of your image and fonts cut off when you upload onto stories. It's VERY annoying! FOTOR is super easy, mega quick and very intuative to use and most importantly, it's FREE! There is an upgraded version which you have to pay for but as the choices are endless on the free version I've never bothered. You can mix and match fonts like I did above and choose from a range of different background colours too, which you can fade out (again see my example above) as much or as little as you want. I always find that the photo resolution suffers a tiny bit when I use FOTOR for my images. It's fine for instagram but for the blog or for bigger projects it's just not quite good enough. Again, as with photoshop/photoshop elements you need to resize the image and/or ensure you don't place your fonts too close to the edges, as parts of your words may get lost once you upload your image onto instagram stories which has a very narrow format. This niftly little app can be added to your phone and is super quick and easy to use. You just upload the image you want to work on, choose what you want it to be formated for (instagram, pinterest, instagram stories, twitter, etc.) and the app will pick the correct image dimensions for you BEFORE you add a single letter. This means that your writing will always display correctly on your stories. So wonderful! Add LOTS of cute fonts, mix and match fonts, choose font colour etc. Bliss! It's 100% free to use too! I used it in the image above! Having used Adobe Spark for a few weeks now, I must admit that I'm getting a tiny bit bored of the limited fonts that are available to me :(. Font selection isn't 100% intuative either (it's this weird wheel, don't get me started). Luckily there is an upgrade option available where I'm sure many more fonts will be waiting for me BUT at a steep-ish £8.99 a month it seems a bit excessive. Very similar to Adobe Spark this is a lovely app you can download for FREE onto your iphone. And just like Adobe Spark, Typorama will allow you to pick which platform you want to use the image on - pinterest, instagram, instagram stories etc. It will then format your image correctly. This feature makes life just that tiny bit better, trust me!!! You can add words in the fonts you like OR (like I did in the image above) choose from set templates in which Typorama has pre-selected an array of fonts for you that work really well together. Think: a blue print you can know will look fabulous. Just like Adobe Spark, Typorama has a limited amount of fonts in its tool box. Now if you want a branded look and only wish to stick to 2-3 fonts which you use again and again, then it's absolutely no problem. However, if you want to have a play with more font options you may need to upgrade. It's only a one off payment of £5.99 and opens up a whole new world of possibilities. Lastly, as you can see on the image above, the free version means you have to make do with the TYPORAMA watermark, which is rather unsightly. Paying the £5.99 means you can remove it! Hope this was helpful you guys. Now before you go, don't forget that you get a handy downloadable PDF outlining all the font tools noted above as well as a quick overview of their benefits and drawbacks. It's like a mini cheatsheet you can refer to anytime you need to :). Just sign up to the mailing list below and you're sorted. Ok, I gotta run now, but before I do just wanted to say a massive big THANK YOU for visiting the blog this year. I truly hope you've enjoyed reading my words and making my recipes. I sure have loved having you stop by :). But, I do need a little break so will be off line between now and the first week of January when I'll be back with LOTS more for you to get stuck into. See you then! P.S. NEED MORE INSTAGRAM HELP? Also, don't forget to subscribe to my mailing list so you can be sure you don't miss a single part of my INSTAGRAM SERIES. In addition, mailing list subscribers get a special discount when they book a 2 hour instagram coaching session, they hear about my workshops and events first and get access to my new FREE and exclusive online facebook photography community. So what you waiting for? Sign up below :).